The December issue is in the mail now! 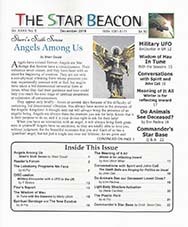 This month Sheri writes extensively about angel experiences, sharing stories from a couple of her close friends. "Winter is for Reflecting Inward"
DO ANIMALS SEE OUR DECEASED LOVED ONES? "The Death Bells are Ringing for Politics as Usual"